You can keep your Sam Raimi-directed versions with their multi-billion-dollar box-office receipts. 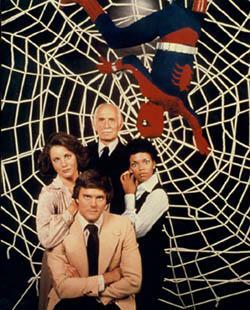 The "Spider-Man" that's burned into my brain is the decidedly lower-budget -- and far more terrible -- version that ran on CBS from 1977 to '79. 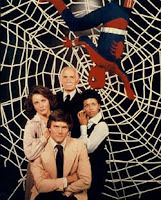 We tuned in to Shazam and Isis on Saturday mornings, Wonder Woman deflecting bullets with her magic bracelets and Batman delivering bon mots, but Spider-Man was the superhero that resonated most. He was young and he had problems -- just like us! OK, we didn't have to deal with a jerky J. Jonah Jameson yelling at us all the time or fight the Chinese mafia, but we did have math homework. Here's a promo clip from the show, which starred Nicholas Hammond (also known as the oldest Von Trapp boy Friedrich in "The Sound of Music"). Ooh and aah as he gently tosses a web onto some villains, and it takes an hour to drift onto them! Marvel as Spidey's hands and feet lightly brush the side of the building as he's dragged by a cable! Spider-Man may have been amazing, but the special effects? Not so much. Hi-Yo, Silver! Get me an Orange Julius! Will the sun still come out tomorrow for Annie?